The Albula Alps are a mountain range in the Alps of eastern Switzerland. 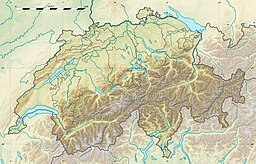 They are considered to be part of the Central Eastern Alps, more specifically the Western Rhaetian Alps. They are named after the river Albula. The Albula Alps are separated from the Oberhalbstein Alps in the west by the Septimer Pass and the valley of the Sursés; from the Plessur Alps in the north-west by the Landwasser valley; from the Silvretta group in the north-east by the Flüela Pass; from the Bernina Range in the south-east by the Maloja Pass and the Inn valley (upper Engadine). The Albula Alps are drained by the rivers Albula, Gelgia, Landwasser and Inn. ^ Reynolds, Kev (2005). Walking in the Alps, 2nd ed., Cicerone, Singapore, p. 275, ISBN 1-85284-261-X. Wikimedia Commons has media related to Albula Alps Range. This page was last edited on 16 September 2018, at 12:46 (UTC).